Are your customers looking at different information pages about your products and services and then heading to an enquiry form or a product purchase? A client sells transportable cabins of different sizes. When the customer heads from a detailed information brochure page to the apply now form, it pre-selects the cabin size they were viewing. It can also select rent, rent to buy or purchase in the drop-down which displayed the different pricing options. On a Woocommerce product page using a gravity form add on. Using Gravity Forms to purchase, enables some product options to be pre-selected based on the information page they were previously viewing or a particular button they clicked. Gravity Forms offers dynamic population functionality with varies options. You can select if you want the field to remain visible and editable to the customer or hidden. You need to go to the advanced tab in the gravity form field, select the checkbox and then give a parameter name. 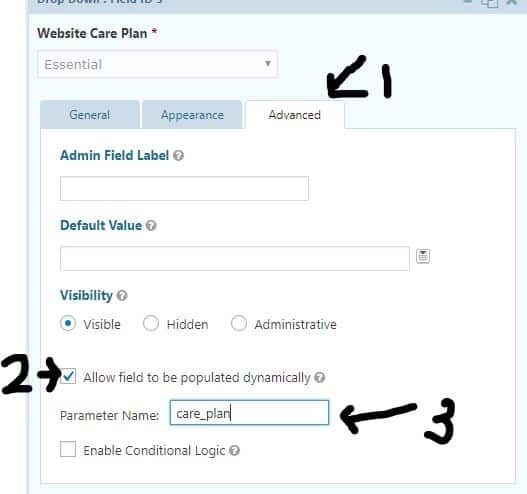 In my example above, on my website care plan page, people can select the level of the care plan. They are then are directed to a form where the level of care plan has already been selected based on what they clicked on the table.